The Greek temple and its architecture have a puzzling relationship with the four-fold. Their historical position – from a modern point of view – is pivotal between the (older) Near Eastern tradition and the (newer) Roman and Christian practices of temple building. The intrinsic value of Greek architecture is of crucial importance, because it provided a grammar of building, which is used to the present day. It is fair to assume that the Greek architectonic language did not grow in a vacuum and was closely related to the outlook in life in general and can be linked to the philosophical achievement of that particular time. The following style periods are recognized in the Greek cultural epoch and are given here as a guideline to the position of the temples. The overview is based on collective data by RICHTER (1929/1970); LAWRENCE (1972); ROBERTSON (1975) and GARDNER (1980). A stagnation took place after the Twelfth Olympiad (296 – 293 BC) followed by a renewal after the 156th Olympiad (156 – 153 BC). Greece was occupied by the Romans in 146 BC. This formal division can be used to construct a communication graph (CF-graph, fig. 74) – pointing to the relation between the ‘Greek cultural period’ as a historical unity and an observer at the beginning of the twenty-first century. The geographical extensions of ‘Greece’ in history are more difficult to define than in the case of Egypt. The choice to see the (Bronze Age) Minoan civilization (2600 – 1100 BC) as a separate historical unit (or cycle) is a decision, which goes deep into the heart of (quadralectic) understanding. Fig. 74 – The CF-graph of the Greek cultural period gives the relation between the Greek historical presence and a modern observer. 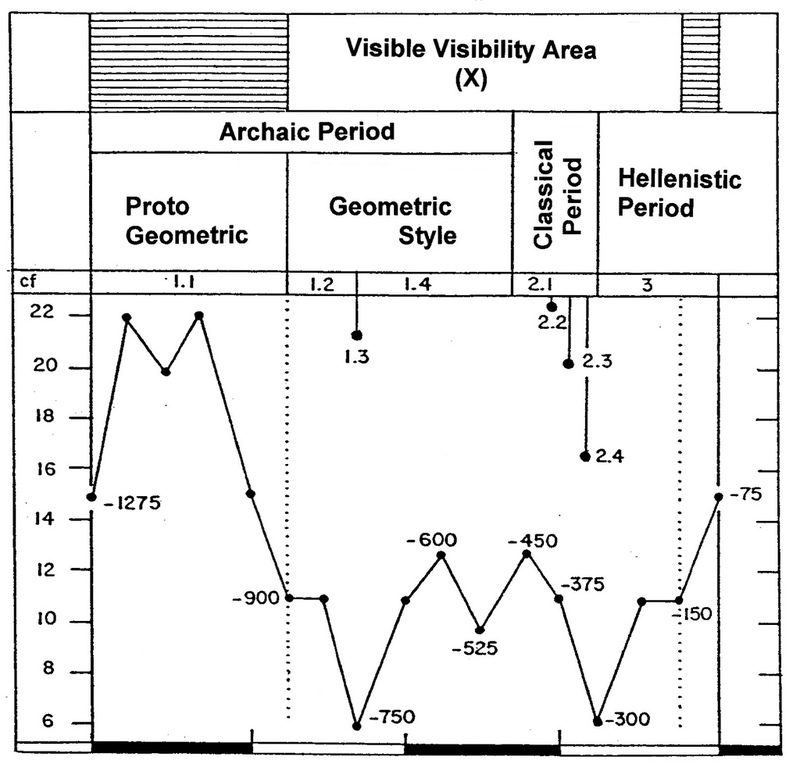 The main period of visible visibility (X) is chosen between 900 BC, when the Geometric period started and 150 BC when Greece was annexed by the Roman Empire (in 146 BC). The full communication cycle (V) covers the time between 1275 BC and 75 BC. The numbers given in the upper part of the figure refer to the different art styles, as given in the text on the previous page. It is significant that during the main period of Greece’ cultural prominence – known as the Classical Period and more specific as the Golden Age of Pericles in the fifth century BC (480 – 430 BC) – the relation between temple design and the four-fold is difficult to establish. There seems to be a discrepancy here (from a dualistic point of view), but not from the quadralectic outlook. A ‘Golden Age’ is – in general – a period of great material wealth (at least in the modern view, which differs from its original meaning as a primordial, ideal state). The typification is given, in hindsight, within the context of an established identity. A ‘Golden Age’ is therefore – in a modern, quadralectic point of view – a feature of the visible visibility of the Third Quadrant. The ‘Time of Prominence’ can be transposed – on a theoretical level – to the third and/or fourth part of the Third Quadrant (abbreviated as III, 3 and III, 4). The struggle between Athens and Sparta came to ahead in the Peloponnesian Wars (460 – 445 BC and 431 – 404 BC). It was the physical outcome of a limited frame of mind. This action provided in the meantime the energy and spirit to counteract the negative results of this struggle. The plague of the year 430 BC, which took the life of about one-third of the population of Athens, was another event of a dramatic dichotomous nature (life versus death). Success, wealth, freedom and achievement came dangerously close to failure, poverty, slavery and misery in the simplified consciousness of the people. A short time consciousness was a mean to safeguard themselves from this opposition. The spirit of carpe diem was a psychological way to express the deep-rooted feelings of fear in day-to-day life. The oppositional setting of the Third Quadrant is also reflected in the letters and works of the philosophers Socrates (469 – 399 BC) and the younger Plato (427 – 347 BC), which were the main representatives of philosophical thought of this period. The four-fold and its imagery were known, and even toyed with, but the division-type was not experienced as a new way of seeing. It was only when Aristotle (384 – 322 BC) and Epicures (341 – 270 BC) entered the scene – in the Fourth Quadrant of the Greek cultural period – that the minds opened up to wider horizons. This historical setting has to be kept in mind when the great achievements of Greek architecture are looked at in more detail. The temples (and other buildings), which were built in the period of greatest prominence during the Classical Period, and are now rightly regarded as the finest representation of Greek architecture. However, they do not contribute significantly to a four-fold presence. If such a condition is sought for, one has to look at buildings of an earlier and later age and/or in areas away from the Peloponnesian center of prominence. Some of the relevant ‘fourfold’ temples will be given here. Their hallmark is either the round ground plan, pointing to the idea of unity and equilibrium, or some distinct use of the four-fold in the formal execution of the building. The presence of these features could point to forms of higher division thinking. It does not mean that the ‘non-tetradic’ temples of the Classical Period were devoid of such a way of thinking. On the contrary, their presence can show a mental stage in which the four-fold has surpassed its numerological significance. Corinth – The ‘grave of Palaimon’ consisted of two small circular temples. They dated from Roman times, but the cult of Palaimon started much earlier. The round temples of the classical and post-classical (Hellenistic) period had its predecessors in the Mycenaean tholos tombs of Late Bronze Age (1525 – 1300 BC). These buildings consisted of a circular burial chamber (thalamos), roofed by a corbelled vault. The tholoi near Mycenae, of which the Treasury of Atreus is probably the most famous one, might be related to the (older) Cretan tholoi of the Mesara type. A scientific discussion is still going on if the Minoans were responsible for the Mycenaean tholoi. The subject of the tombs will further be considered in Chapter 3.7 (p. 462), which deals with the funerary architecture in general. Florian SEILER (1986) reported on the research results in the field of Greek tholoi. He described, in addition to the above-mentioned examples (minus Corinth), the tholos in Lathuresa (Attica), dating from the Late Geometric Period (7 – 8th century BC), the tholos in Eretria (5th century AD) and in Paros (4th century AD). The Arsinoeion in Samothrake (289-281 BC) can probably be seen as the last of the great Greek round buildings. The tholos of Athens was originally not a temple, but identified as the place where the fifty prytaneis or presidents of the Council could ‘conveniently dine together at the public expense’ (quotations from Demosthenes and Pausanias). 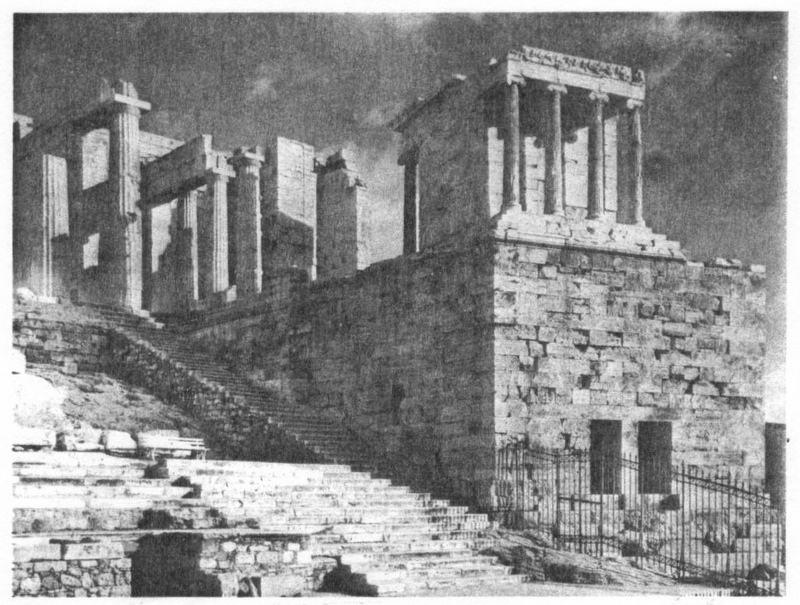 Homer A. THOMPSON (1940/1975) gave a detailed account of the tholos in Athens pursuant to excavations between 1933 and 1939. He discovered early structural remains (buildings A and B) at the foot of the hill to the southeast of the later tholos. A small kiln was found, although heavily damaged by a well cut in the fifth century BC. The tholos itself was built around the year 470 BC, just after the buildings of the area were seriously damaged by the Persians in 480/479 BC (fig. 75). Fig. 75 – This plan gives the area around the tholos of Athens as it must have looked in the middle of the fifth century BC, with additions of the early third century. A tetrastyle Doric Propylon can be seen to the right, near the Old Bouleuterion. This small temple was built in the Augustan era, soon after 30 BC. The round structure, with six pillars to support the roof, became probably part of a religious complex (which also included the Bouleuterion or building for city council meetings, literary meaning ‘place for planning’) at the end of the fifth century. A new one replaced the old Bouleuterion. The old building was converted into a sanctuary for a Mother goddess, which was also used to house an archive for public records. The use as a place of worship might have increased in the third and second centuries before Christ. An altar of Artemis Boulaia stood within the tholos precinct. The tholos of Athens, with its checkered functional history, has made an imprint as a circular building in the later part of the Greek cultural history. It would be too much credit to say that such type of building was a source of great inspiration. The ‘quadralectic’ qualities, other than its round shape, are difficult to pinpoint. The Tholos remains therefore an enigmatic building as far as the relation with a particular form of division thinking is concerned. The tholoi of Delphi is a circular, marble structure with twenty Doric columns topping the base of three steps (fig. 76). It is situated in the center of the sanctuary of Athena Pronaia and built between ca 380 and 360 BC (late Classical), possibly by Theodoros of Phokaia. The exterior diameter is 14.76 m and it has a height of 13.5 meter. Three columns have been restored along with replicas of the corniche, metopes, epistyle, triglyphs and some of the guttering of the roof. Fig. 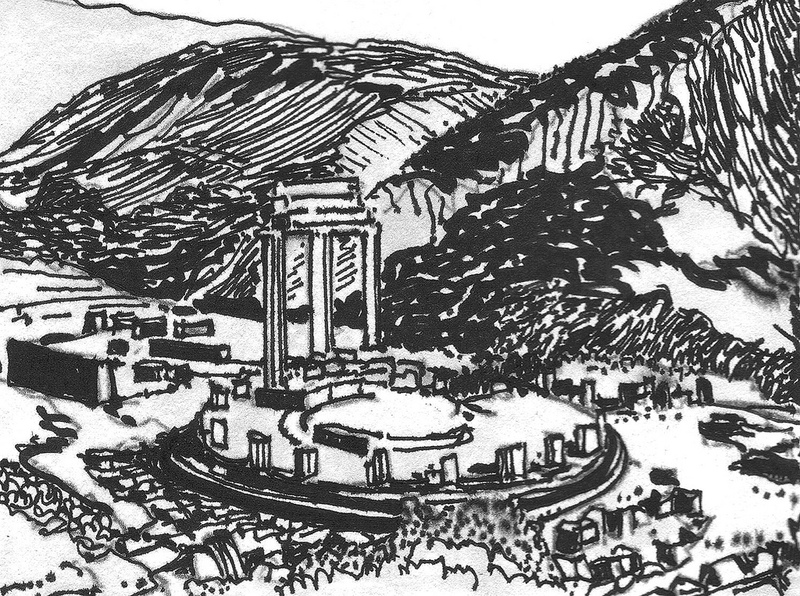 76 – The tholos of Delphi in the sanctuary of Athena Pronaia. Only three of the original twenty Doric pillars are reconstructed. The tholos of Delphi is related to the famous Delphic oracle. This cult had its greatest successes in the eighth and seventh century, i.e. long before the tholos was built in the fourth century BC. 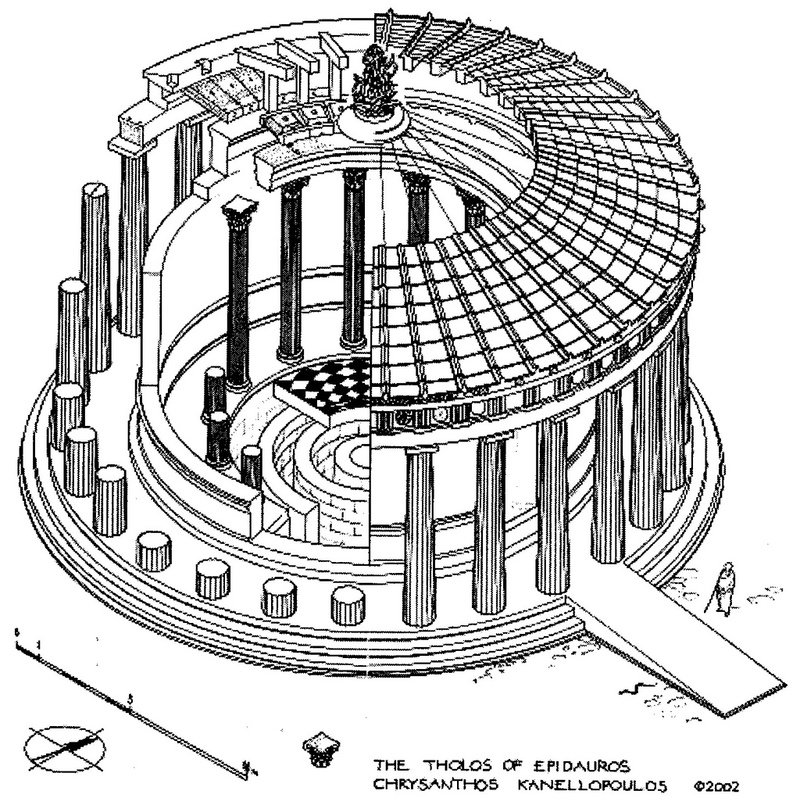 The circularity of the tholos of Delphi can be seen as an indication of higher division thinking, but there is no reference to a particular number in the outward architectural form. Twenty columns might be a multiplication of five times four, but such numerological jugglery is not directly relevant to the tetradic way of thinking. The function of the oracle, on the other hand, as a medium of predicting the future, fits in with a wider outlook. The divining quality is, in fact, part and parcel of the quadralectic philosophy. If the universal communication graph (CF-graph) is accepted as a detailed representation of the relation between the visible and invisible in a four-fold setting, then the acceptance of the graph as a means of divination is only a natural consequence. The oracle of Delphi and her mystical powers can be traced back to the eighth century BC when the first sanctuary of Apollo at Pytho (Delphi) was recorded (PARKE, 1939). Before that time, worship to Gaia, goddess of Earth, and her daughter Themis, was known to exist, which also included an element of oracle speaking. The most famous Delphic injunction was carved into the lintel at the Temple of Apollo: Gnothi seauton (Know Thyself). This type of wisdom is very much in line with the quadralectic outlook. Choosing a conscious division-environment is one thing, but knowing one’s place in the continuous interaction with the environment is another thing. A comparison (analogy) can only be established and verified if the position of the observer is clear and unambiguous. The tholos at Epidaurus was dedicated to Asklepios and built around 360 – 330 BC by Polykleitos the Younger (of Argos). The cyclic concept of space fits in a four-fold setting, but there is no ‘numerological’ support (fig. 77). Fig. 77 – The tholos at Epidaurus has a diameter of 21.80 meters. Fourteen Corinthian pillars make up the inner circle (the inside of the sekos). The Museum of Epidaurus has a Corinthian pillar with the double row of acanthus leaves wrapped around a bell-shaped echenus designed by Polykleitos the Younger. It became a ‘model’ of the capitals of the inner colonnade of the tholos. The original Corinthian capital is said to be invented by Kallinachos. The twenty-six Doric pillars of the outer circle (the outside of the sekos) had a length of seven meters. The pillars supported the architrave, the circular metopes and the frieze. The quixotic efforts by a Greek researcher (‘Words Unspoken, Tholos unveiled’ by ALTANI, 1999) to divide the ceiling of the tholos into equal parts – in order to reach the ‘required number of degrees’ (360) – is not wholly convincing. Its presumed function as ‘a complete astronomical monument’ is hard to prove from the given material. The number of capitals in the colonnades, respectively 14 (inner) and 26 (outer circle), do not point to a regular division of the 360 degrees of the circle. The counting of the rays and number of coffers had to come from another evidence than the roof, because that no longer exists. The inner garland of the ceiling contained, in the astro-archaeological approach of Altani, forty coffers and the double outer garland had hundred and forty coffers. The total number was therefore, hundred-and-eighty i.e. half of the Pythagorean number three-hundred-and-sixty. An informative paper by Henning OERTEL (2000) gives the recent knowledge of the tholos. A model by Chrysanthos Kanellopoulos is given in figure 78. Fig. 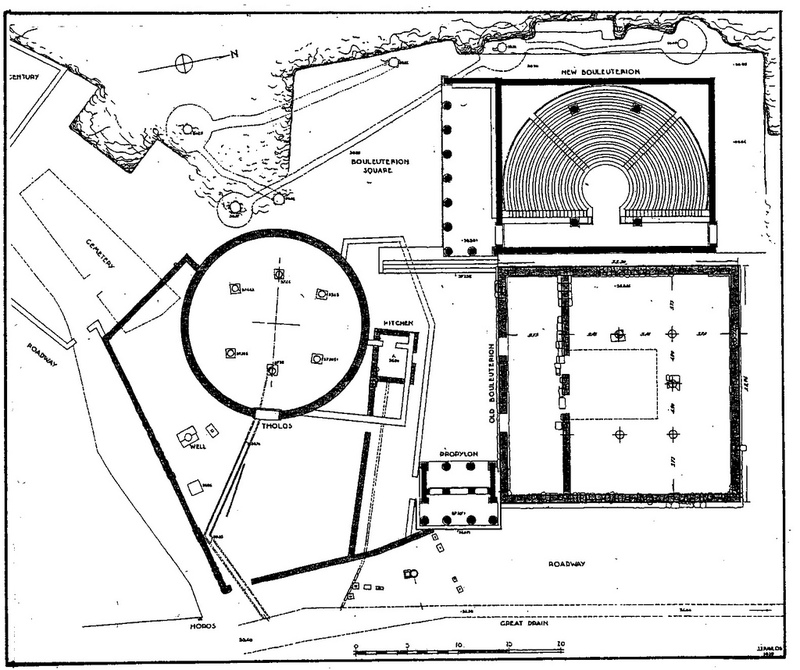 78 – This drawing of the tholos of Epidaurus (Greece) might represent the actual elevation of the building (after a model given by Chrysanthos Kanellopoulos, 2002). The building of the tholos in Olympia (Philippeion) started ca 338 BC when the tholos at Epidaurius was about to finish. Philip of Macedon, the father of Alexander (The Great), initiated the building to commemorate his victory over the coalition of Greek city-states at Chaironeia. The Battle of Chaironeia was the decisive Macedonian victory, which opened the way to Macedonian control of all Greek territory to the south. The battlefield is located directly north of Livadia. At present, there is only the ‘Lion of Chaironeia’ left. A marble funerary monument marks the communal grave of the Sacred Band of Thebans. The five-and-a-half meters high lion was discovered in 1818 and restored on a plinth of three meters high. Fig. 79 – The tholos in Olympia was situated in the northwest corner of the sanctuary of Zeus (Altis), to the west of the Temple of Hera and was built between ca. 338 – 300 BC. The eighteen Ionic columns on a circle of thirty-six stylobate blocks gave a regular division of the circle. The division of the circle is part of the total design. The thirty-six stylobate blocks centered under and between the eighteen columns are related to the three-hundred-and-sixty degrees division of the circle. However, it would be too easy to conclude that such a division is a direct result of the four-fold way of thinking. The Temple of Poseidon at Isthmia (Corinthia) was one of the four major Panhellenic sanctuaries (Olympia, Delphi, Nemea and Isthmia/Corinth). The site was known for the Isthmian Games, which were only second to the Olympian Games. Oscar Broneer and Elisabeth Gebhard of the University of Chicago published the results of excavations in the area, which started between 1952 – 1961 and were continued by the University of California directed by P. Clement between 1967 – 1972. The present interest is focused on two round temples located at the grounds of the Palaimonion complex. ‘The grave of Palaimon’ (or Hadrianic Temple of Palaimon) was situated on the eastern precinct and can be dated from around 120 AD. The second rotunda (or Antonine Temple of Palaimon) was in the southern area, where building started some forty years later, in ca. 161 AD. Fig. 80 gives the situation of the complex around 120/138 AD (Phases IIb) with the position of the Antonine Temple of Palaimon (Phase V) projected in the southern area. Fig. 80 – A reconstruction of the Sanctuary of Melikertes-Palaimon at Isthmia. This sanctuary was situated in the Southeast Precinct of the Sanctuary of Poseidon and dated from around 120 AD. 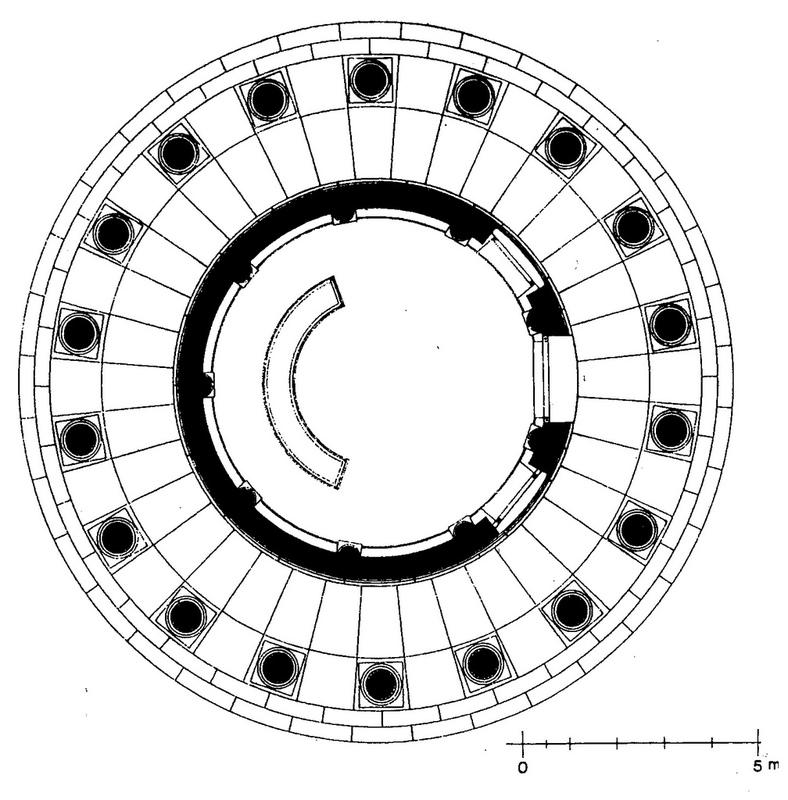 Some forty years later a similar rotunda was built in the southern area (Phase V). 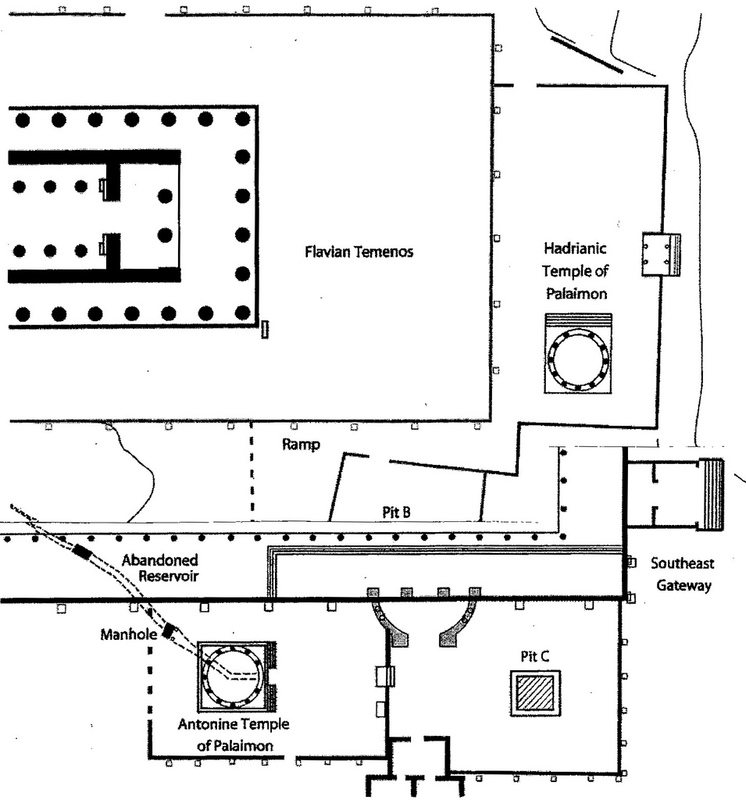 The position of this latter temple is projected on to the earlier position (Phase IIb). The cult of Palaimon must have been much older and the sacrifices of black bulls were part of the ceremony. The Palaimonion was built on the site of an old Stadium, which might have dated from the sixth century BC. A new stadium was built in the times of Alexander the Great, when Corinth became the major city. This stadium is still buried underneath some two to six meters of earth. The hippodrome, which was the center point of action during the Panhellenic Games, was situated west of the Sanctuary. It can be concluded, that the tholos-like structures within the Greek cultural period had a long and varied history. Their origin seemed to be way back in time and could be related to the funerary culture of the Mycenaean Late Bronze Age or to the (even older) Minoan culture on the island of Crete. 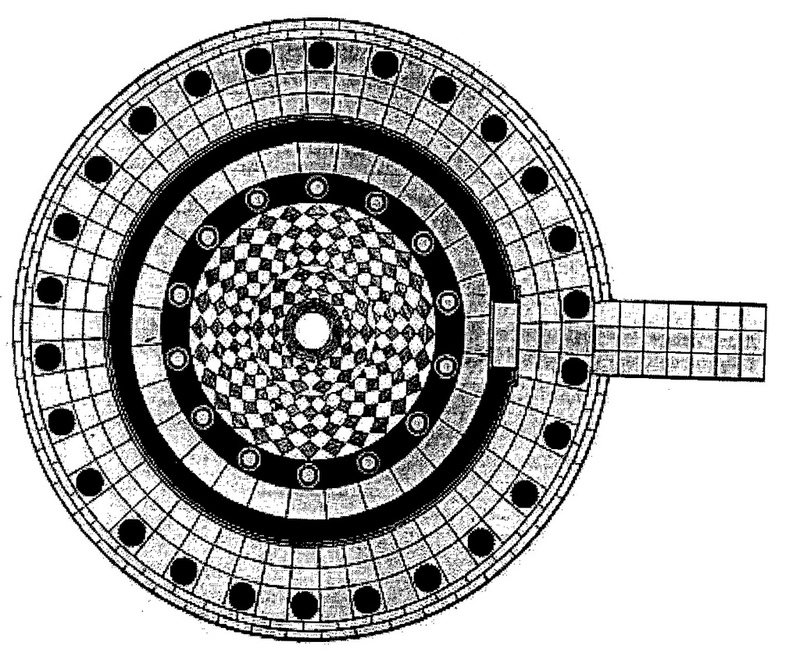 The use of the circular ground plan as an architectonic idea might, on the other hand, have been developed within the Greek cultural period sensu stricto. In that situation, the use of the circular could have found its origin in the type of division thinking within the development of a cultural unity. The tholos of Athens, as the oldest of the round structures discussed here, was initiated as a public building. It probably took on the function as a temple at a later stage. The tholos of Delphi was younger. The sanctuary was an ancient place of worship, like those at Epidaurus and Olympia. The tholoi in these three locations all dates from the end of the fourth century BC. The round temples reflect either a reaction (opposition) towards the rectangular or a genuine intention to catch the tetradic-circular spirit. The Greek cultural period had entered its Fourth Quadrant in 375 BC (see fig. 74) and the leading intellectuals and artists were ready to embrace the circular and its associated symbolism. The round structures within the Sanctuary of Melikertes-Palaimon, known as the Hadrian and Antonine Temple of Palaimon were Roman, rather than Greek. The building of these temples occurred in the second and third quarter of the second century AD, and is closely related to the ‘tetradic period’ in the Roman cultural period (end of the Third – beginning of the Fourth Quadrant). The Greek cultural period as an independent creative unit had lost its direct visibility much earlier, when the Romans conquered Greece in 146 BC. Its influence, however, only increased when the cultural heritage was more or less raided by the Romans and incorporated in their own visible presence (HAFNER, 1983). The next chapter (3.2.3) will show that the round temple was also popular within the Roman cultural period, right from its early beginnings. The main round sanctuaries are the three Temples of Vesta (two in Rome, one in Tivoli). The temple of Vesta at the Forum Romanum has a history, which goes back to the foundation of Rome. A number of restorations took place after destruction and decay. The erroneously called Temple of Vesta at the Forum Boarium dated from the later second century BC and the one in Tivoli was created around 80 BC. The line from the Greek round temples into the Roman examples appears to be a smooth one. A closer inspection will be necessary to discover the actual place of such structures within the cultural context. The Greek round temples of the Classical Period (475 – 300 BC) – like the tholoi of Athens, Delphi, Epidaurus and Olympia – were created in spirit of opposition. They found wider horizons in the multiplicity of the cycle. 1a. The simplest form is the temple in antis in which the naos (cella) is preceded by a pronaos (antechamber) flanked by forward projection (antea) of its sidewalls. 1b. The double anta temple, with antea at each side, is generated when the design is mirrored. 2a. The prostyle temple has a row of columns in front of the antae (one column in front of each of the antea, with two or four columns in between). An example of a prostyle temple with the columns only on the principal facade is the Temple of Vespatian on the Lower Forum in Rome (see for a picture of this Roman emperor, whose son Titus destroyed the temple in Jerusalem, fig. 8). 2b. If this design is mirrored the amphiprostyle temple with a similar row of columns on the rear end of the temple. 3a. The classical form, often from the second half of the seventh century onward, was the periteral (peristyle) temple in which the cella was surrounded on all four sides by a colonnade (peristasis). The Parthenon in Athens is the best example. The Poseidon temple in Sunion is another peripteral temple, built directly after the Battle of Marathon (490 BC). Also the Temple of Castor and Pollux on the Forum in Rome has columns on all four sides. 3b. A variety of this type is the peripteral sine portico temple. This type has its columns on three sides only and a plain back wall. An example is the Temple of Mars Ultor on the Forum of Augustus in Rome, built for Emperor Augustus in 20 BC, after the return of the Roman standards captured by the Partians. 4. The dipteral temple has a double row of columns on all four sites, like the temple of Artemis. Decastyle (ten columns on the front, Temple of Venus and Rome). No preference of the use of a particular number in time or place seemed to be noted here, or was at least not indicated by Vitruvius. He was more concerned with organizing the multitude of the visible. The mighty temples of Hera at Paestum (south of Naples (Italy) – in the Greek colony known as Poseidonia – are a case in point. The Temple of Hera I, or ‘Basilica’, was built in 550 BC and typified the Archaic Greek architecture. The temple had nine, Doric columns at the end and eighteen on the sides, or a ratio of 1: 2. There is also a row of columns down the middle of the interior. The second oldest temple at Paestum is the Temple of Athena, which is also called the Temple of Ceres. However, this name is a misnomer given in the eighteenth century. The temple is constructed around 500 BC, on the highest point of the city. It was built in the Archaic Doric style with rather heavy columns. Goethe termed them as ‘oppressive’. The temple is peripteral and hexastyle with six by thirteen columns, in accordance with what later became the Doric order. The internal parts of the temple are detached from the peristyle and the porch (pronaos) uses eight Ionic columns: four in front, two on the sides and two engaged in the antae of the walls of the porch (fig. 81). Fig. 81 – Temple of Athena in Paestum. The other Temple of Hera (known as Hera II) at Paestum, once thought to be the Temple of Poseidon, is the youngest of the three (c. 460 BC). The architecture followed a standard Doric form, with six columns on the end and fourteen columns on the side. The ruins of Paestum were ‘rediscovered’ by Johann Joachim Winckel-mann in the 1750s and caused a widespread enthusiasm for the Classical Revival. The architectural style of the Neo-Classicism, which was a direct result of this new field of interest, spread its wings all over Europe (and beyond) towards the end of the Third Quadrant of the European cultural period in 1800. Its roots, in Paestum, are more Greek than Roman and its (re) interpretation seemed to be more inspired by the original Doric than by the Ionic style. The Parthenon in Athens is probably the most famous example of a Greek temple. It dated from the Classical Age of the Greek cultural presence in the fifth century BC (fig. 82). Fig. 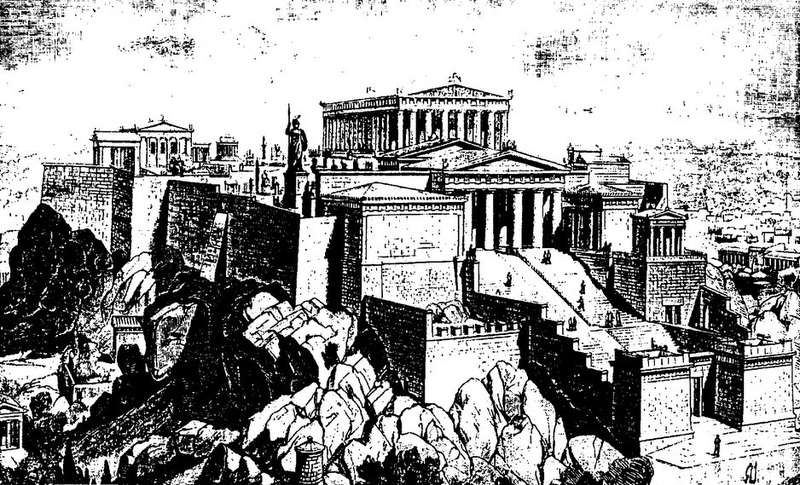 82 – A view of the Acropolis in Athens during its time of prosperity towards the end of the fifth century BC. The Parthenon can be seen in the middle. The Erechtheion is situated to the left and the small temple of Nike Apteros to the right, overlooking the Pro-pylaia. A reconstruction by the archeologist Hermann Thiersch. The Parthenon building, measuring 30.8 x 69.51meter, was conceived by the architects Ictinus and Callicrates between 477 and 438 BC. Eight columns mark the front (and back) of the Parthenon temple and seventeen columns cover both sides. De cella or inner temple has two rows of ten pillars. The famous sculpture of Athena by Phidias was placed here. The forecourt (or pronaos) had six columns, just like its mirror image, the ophistodom. Finally, the holiest place had four Ionian columns. This sacred part was the ‘Parthenon’ or ‘Hall of Virgins’, because young girls served the goddess Athena from Athens during the Greater Panathenaea festivities, held every four-year on her birthday. This cult to Athena (or Minerva as the Romans called her) was also known from the temple in Paestum. The four buried horses in the southern part of the Parthenon (DEGRASSI, 1989) posed some interesting questions.They were part of a quadriga and dated from around 570 BC., i.e. some hundred years older than the building itself (Early Archaic). The quadriga probably belonged to an older temple, which was dedicated to Athena Polias. The act of burying was explained by a desacretion, which made them useless for further worshiping. 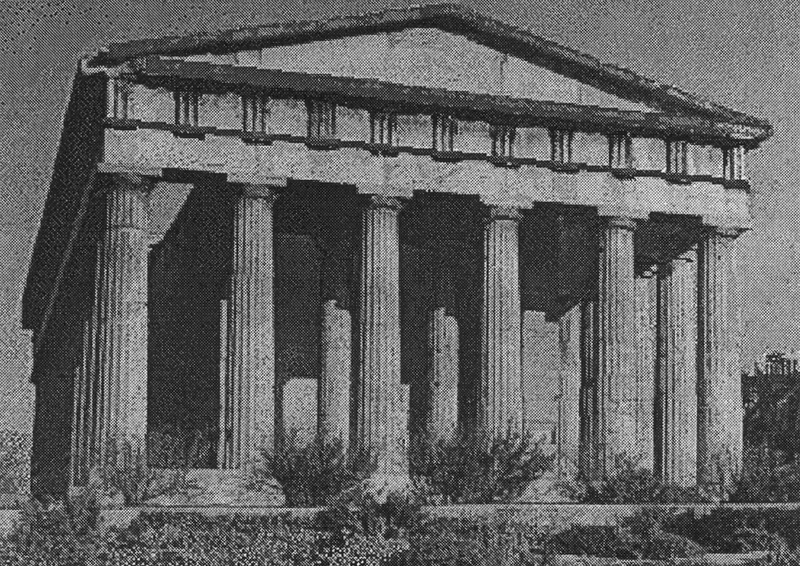 The Temple of Hephaestos, situated on the agora in Athens, is – just like the Parthenon – a good case in point that the four-fold spirit was not directly translated into countable architectonic features (fig. 83). The Hephaesteion was built around 449 BC in a Doric hexastyle and dedicated to Athena and Hephaestos (God of fire and metalworkers). The peristyle consisted of six columns on the fronts and thirteen on the sides. Fig. 83 – The temple of Hephaestos (Hephaesteion or Theseion) is a typical Greek temple of the Classical period, with a dedication to multiplicity, but no specific reference to the four-fold. The tetradic spirit in architecture had to wait till after the completion of the Parthenon and the Propylaean (the Gateway) in 437 and 430 BC respectively. 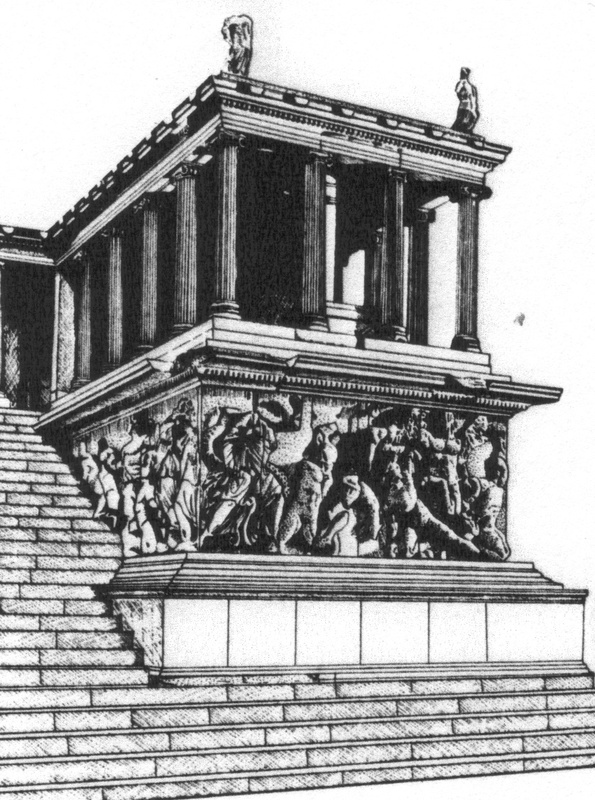 Pericles ordered Callicrates in 448 BC to rebuilt the Nike temple, which was destroyed by the Persians in 480. The actual work started in 430 BC, because the before-mentioned activities and a conflict with Mnesicles had to be solved (fig. 84). Fig. 84 – The Temple of Athena Nike at the Acropolis is of the Ionic type, with four columns on both side of the cella. The newly designed Nike Temple on the most western side of the Acropolis found its inspiration in Ionia, the important colony of Greece in Asia Minor (Turkey). It is worthwhile to have a glance on this local source of intellectual development, which had such an impact on the history of thinking within the Greek cultural presence and beyond. It is – in this (architectural) context – only possible to point superficially to the most important elements of the far-reaching ideas created in this area. However, it is fair to say that the Ionian ‘style’, like it became known in the history of architecture, must be seen in its regional and historical setting. The ‘naturalistic’ philosophical ideas, which originated and were developed in Asia Minor had their bearing on architecture in times to come. The Early Ionian natural philosophers, like Thales, Anaximander and Anaximenes put their mark on the early Greek consciousness and can be regarded as the first philosophers in the Western tradition. They questioned the origin and fundamental nature of the cosmos in a way, which was not done before. The emphasis of their thinking was geared towards matter rather than immaterial spirits. These ‘holistic’ philosophers pointed the way to the scientific principles of the permanence of substance. Their exploratory led them through the various stages of visibility. Thales of Miletus (c. 624 – 547 BC; fig. 85) sought to explain the Universe in terms of water. He must have been a man of enormous prestige. He was not only an engineer, but also a philosopher, scientist and mathematician. Fig. 85 – Thales of Miletes (c. 624 – 547 BC). The early polymath became known for his knowledge of astronomy and the prediction of the eclipse of the sun (in 585 BC). Diogenes Laertius, an Ioanian writer of the third century AD, quoted him by saying: ‘Hieronymus (a pupil of Aristotle) says that Thales even succeeded in measuring the pyramids by observation of the length of their shadow at the moment when our shadows are equal to our length’. This is not only a screwed observation, but also a ‘tetradic’ use of the principle of analogy, assuming that if the length of the shadow of one object coincides with its length, this will be true for all other objects. Anaximander (c. 611 – 546 BC) was a disciple of Thales. He argued that all life came from the sea and that the present life forms were the result of adaptation. He advanced further to a principle, which could explain water itself and named it, infinity (apeiron; ROSEN, 2004): ‘the substance without limits, Eternal and ageless, it encompasses all the worlds.’ The quadralectic interpretation, with the watery element in the Fourth Quadrant, is followed by a new First Quadrant, obeying to his description of the unbounded. The Ionian philosophers rejected the Greek gods and the Greek pantheon. Xenophanes (c. 570 – c. 478 BC) disliked the gods to which Homer and Hesiod ascribed ‘all things that are a shame and a disgrace among mortals, stealing and adulteries and deceiving on one another…’ He liked to equate ‘God’ with the cosmos. Later Ionian philosophers, like Heraclitus, Empedocles and Anaxagoras, departed from the view that one element marked the origin of nature. The early physicists adopted a wider, mechanical concept of the universe. The emphasis shifted from a static approach (First/Third Quadrant) to a more dynamic setting (Second/Fourth Quadrant). Heraclitus, surnamed the Obscure, was born in Ephesus around 530 BC. He proclaimed a doctrine of universal change – there is nothing permanent in the world around us. He suggested a new interpretation of the Fire: all things are exchanged for fire and fire for all things. Fire is Zeus (I), Deity (II), Logos (III) and Justice (IV). Heraclitus’ had a cycle of changes in mind when he tried to explain the origin of the world. Fire (in a quadralectic interpretation: the First Quadrant) goes through a process of condensation (quenching) and becomes water and earth (the downward/backwards way). The upward way is the inverse of this process. This latter interpretation lead (in a Third Quadrant) to a doctrine of Opposites in which all things pass successively through their opposites. Something new only comes into being when like is coupled with unlike. Out of this process of coupling the one may come to all, and out of all, comes one. Empedocles, born at Agrigentum (Sicily) around the year 490 BC, is the most typical representative of the Later Ionian School. He explicitly stated the primitive substances as four: fire, air, earth and water. These Four Elements (roots, rizomata) are underived, imperishable and homogeneous. Only a combination of the elements produces definite substances. 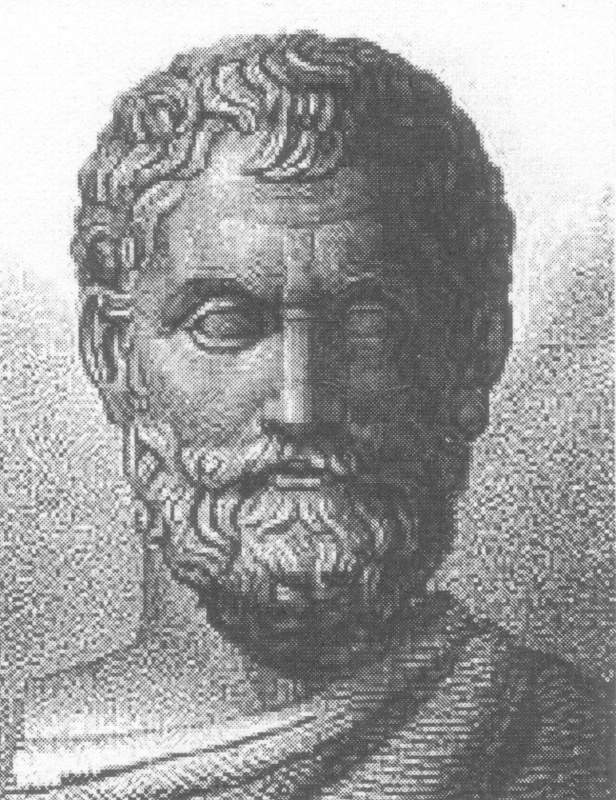 Empedocles’ psychological doctrines are based on reciprocacy (or ‘double dialectic’). In the case of sight, there is an emanation from the eye itself, which goes out to meet the emanation from the object. Thought (in the Second Quadrant) depends on the mixture of the four elements. The soul (the First Quadrant), on the other hand, did not consist of elements, but it is also not an entity apart from the body. Many aspects of Empedocles’ ideas, and especially his theory of the elements, has been constantly misunderstood throughout the Western history. People with rigid ideas, living during times when oppositional (dualistic) tendencies were eminent, could not grasp a four-fold view. However, the theory of four ‘undividable’ elements had a remarkable resilience. Eventually, it found its demise in the Western cultural history in the middle of the seventeenth century in the hands of Robert Boyle (1627 – 1691). His book ‘The Sceptical Chymist’ (1661) was written in the triumphal days of oppositional thinking of the European cultural history. The philosopher Anaxagoras (c. 500 – 430 BC) followed Empedocles in his rejection of the static state of Becoming and was focused on the nature of plurality and change. He regarded all things to be made of seeds (stermata) and things (chremata). Anaxagoras expressed a ‘Fourth Quadrant’ look on matter. An empirical (visible) thing was a mixture, consisting of small individual particles, which were qualitatively indeterminate, though definite qualities were really present in it. These minute primitive particles remained divisible all the way into the invisible. This small excursion into the world of philosophy was intended to show some of the philosophical backgrounds of an area (Ionia), which produced a distinct architectural style. The debt to the ‘Ionian’ type of thinking, which is reflected in its buildings, has to be realized in order to appreciate the quadralectic architecture to the full. Seven, relative small temples of the so-called Prostylos-type can be found in Ionian cities of Priene, Magnesia and Pergamon (fig. 86). They vary in their Ionic or Doric order, but the number of four pillars in front of the temple (prostyloi) is a leading aspect. The temple in Priene, dedicated to Zeus Olympios, is the oldest and dated from the third century BC. Its position at the back of a market was a significant departure from the Greek temples, which could be viewed from all sides. The prostylos temple aimed at an impressive (four-fold) façade rather than an undetermined (multitude) of pillars in a rectangular plan. Fig. 86 – The ground plan of five temples of the Prostylos-type in Pergamon is typified by four pillars in front of the building. The Great Altar of Pergamon and its Telephos Frieze, as it was rebuilt in the Staatliche Museen of Berlin (Pergamon Museum), gives an impression of a ‘Gesammtkunstwerk’ along ‘quadralectic’ lines. The altar has two Ionian type temples (peristyles) on both sides of a colonnade, which can be approached by ten-meter wide steps (fig. 87). The significance of the numbers two, three and four are brought together in the multitude (of the steps and colonnades). The building dated from 175 to 150 BC and was initiated by King Eumenes II. The altar was removed from its original position in 1879 (although only one-third of the original building could be recovered) and the restoration of the Telephos Frieze, which is about hundred and twenty meters long, was completed in 1996. The masterful scenes on the frieze depict more than hundred figures in fierce fighting and the theme is therefore, situated – in a modern interpretation – in a Third-Quadrant (III) setting. However, also a sculpture of a horse was found, which must have been part of a quadriga. A full reconstruction model placed a number of quadrigas on the back of the original building. However, this part of the building was not recovered and is not on show in Berlin. It has to be kept in mind, that the fighting scenes of the Telephos Frieze are only part of the architectural and sculptural story. The tetradic message of the harmony of the multitude – as represented in the quadrigas – is probably less visible and underrated in the reconstruction of the Zeus temple in Berlin. Fig. 87 – The Great Altar of the Temple of Zeus is seen here as a reconstruction in the Pergamon Museum in Berlin (Germany). The temple is a Gesammtkunstwerk, bringing various disciplines of art and architecture together. The Temple of Zeus was created towards the very end of the visible visibility period (X) of the Greek cultural presence, when full maturity was reached. The massive steps to the left led into the rectangular inner court of the complex, which was surrounded by further colonnades. These latter structures might have been crowned by quadrigas. A preliminary conclusion can be drawn now. The history of Greek temple architecture is an intriguing one to which the given examples of round and rectangular buildings can hardly do justice. There are some lines to a possible tetradic influence in the Ionian-type, but there is hardly a reference to any specific division-thinking. It means that the emphasis was, in a time of the greatest visibility of Greek architecture, i.e. the fifth century BC, not on the four-fold, but on the multitude. These historical lines, from the ideas to the material execution and its subsequent comprehension, has to be studied in much more detail as is done here in this short survey. The Greek architectural history offers the perfect material to set out in this uncharted territory. The link between the mental and material (architectural) setting within a cultural development is hardly ever studied on a structured and comprehensive way, but it can turn out to be a formidable tool to appreciate the Greek achievements in time.